The front page of the Times features the second instalment of the paper's interview with the pregnant British teenager found in a refugee camp, four years after she went to join the Islamic State group in Syria. 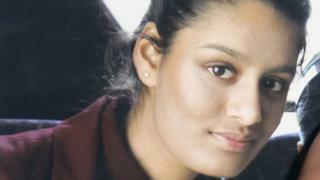 Shamima Begum admits she will face possible terrorism charges and intense media interest if she does return to the UK, but says she is "desperate" not to be separated from her baby. She also speaks of her fear that she might never see her jihadist husband ever again - whom she says she still loves "very much". The Times says it can reveal that he is suspected by police of being involved in a terrorist plot in his home country of the Netherlands. A woman who grew up in Middlesex has told the Mail she is "proof jihadi brides deserve a second chance". Tania Joya was nicknamed "the first lady of IS" after marrying an American who became one of the group's senior commanders, but she fled Syria after claiming to renounce extremism, and now lives with her second husband in Texas. She argues Shamima Begum could be rehabilitated - "if she is willing to accept her mistakes" - and believes the teenager "will outgrow the brainwashing, as I did". She says Ms Begum's situation is "100% her fault", but insists she should be helped "for humanitarian reasons". The Daily Express highlights a claim made by Donald Trump's that trade between the UK and the US will increase "very substantially" after Brexit. The intervention was, it says, a "much-needed fillip" to Theresa May, following another week of "gruelling parliamentary wrangling". The paper's editorial argues that since the referendum result, both the Conservatives and Labour have failed to grasp the sense that "this is a time of the most enormous opportunity ahead" and praises Mr Trump for injecting a "note of optimism and common sense" into the proceedings. The Guardian has what it calls an "exclusive" interview with the parents of Dawn Sturgess, the woman who died in the Wiltshire Novichok poisonings last year. Stan and Caroline Sturgess tell the paper they believe more of the nerve agent could be found in the county and call for "justice" from the government. Mr Sturgess complains that in his view, ministers have not given them all the facts, and says "if anyone, I blame the government" for exposing residents to risk by settling the target of the attack, the former Russian spy, Sergei Skripal, in Salisbury. The couple also say they took "huge relief" from tests which showed their daughter had no recreational drugs in her system when she died, after press reports "unfairly portrayed" her as a homeless addict. According to the Sun, bosses at BBC Radio 2 "are set to risk the wrath" of older listeners, by banning hits from the 1950s. "Crooners" will apparently "get the boot" as part of the station's efforts to "evolve" with its audience, and attract younger listeners. A Radio 2 source is quoted as saying that the move is "not the sort of thing managers would ever announce" - so the plan is to "just quietly play less and less 50s music until there's little on the playlist". A Radio 2 spokeswoman has told the paper that listeners will continue to hear tracks from the 50s, 60s and 70s.